Commercial kitchens are evolving to suit the increasing usage of food delivery services. With delivery platforms expected to have an annual growth rate of 9.4% by 2023, there is no doubt that this phenomenon will have a lasting effect on restaurants and cafes. Without question, the greatest challenge for food businesses will be in achieving cohesion between their two types of customers: dine-in and delivery. Dine-in customers are becoming increasingly aware of the delivery orders that are vying for attention in restaurant and cafe kitchens. There is a growing negative perception that customers ordering through delivery partners are receiving their meals first and experiencing priority service. Besides, there’s nothing more annoying than waiting extensively for your entree, while eight Uber Eats drivers have come and gone. Both dine-in and at-home consumers want the same thing: swift delivery of hot food, direct to their dine-in table or home front door. In order to meet the expectations of both customers, existing and new restaurants are exploring the latest options to maximise output and effectiveness of their kitchens. Below, we detail three emerging trends for catering to the growth of food delivery. A new concept when designing kitchens is delivery windows. Think drive-through windows, but without the drive-through. The idea is to remove the flow of delivery drivers walking through the dining area of restaurants, diverting them out of customers’ sight. These windows provide a direct link to the kitchen, enabling delivery drivers to collect orders from outside the building. In order to accommodate these windows, businesses must give extra consideration to their commercial kitchen layout. It may be necessary to rearrange the commercial kitchen, as equipment may need to be relocated to suit. Processes should be systematically adjusted to promote continuity while meeting revised workflow needs and expectations. Watch the design video below. Food businesses are looking for efficient ways to fulfil orders during peak times and alleviate kitchen overload. A common solution comes through designs that allow for segregation in the kitchen. Cafes and restaurants are beginning to designate some of their commercial kitchen areas and equipment solely for delivery orders. This concept is great for larger footprint commercial kitchens, however, may not be totally viable for smaller kitchens. In saying this, many small commercial kitchens aren’t currently making the most of their space. In these cases, compact equipment and intelligent workflows could be considered in line with plans for redesign and improvements. Common equipment kept aside for delivery orders include heated holding cabinets and speed ovens. However, this will depend on a restaurant or cafe’s menu. Generally, additional countertop and finishing equipment can be easily separated from the main kitchen, diverting some of the workload. These ‘virtual restaurants’ are on the rise, with entrepreneurs seeking innovative ways to capitalise on the food delivery phenomenon. Created without the conventional aspects of the business, ghost kitchens have no seating, tables, storefront or even front-of-house staff. Ghost kitchens are typically active online and across social media platforms. They are usually also connected through delivery service apps, such as Uber Eats and MenuLog. Delivery-only or production-only commercial ghost kitchens remove the pressure from physical restaurants. Businesses using ghost restaurants are able to cut down wait times and increase quality for their customers even more. The restaurant kitchen is able to focus on dine-in meals and the ghost kitchen dishes up for delivery orders. Whether the commercial ghost kitchen is attached to the restaurant or operates as a standalone kitchen, functionality and food safety should always remain paramount. Similarly, large orders and peak periods need to be taken into consideration. Restrictions on staff mobility should be avoided, and layouts must be conducive to fast-paced environments. Intelligent foodservice design is the key to successfully navigating the emerging issues surrounding food delivery. Layout, functionality, workflow, food safety, menu consideration and equipment specification are all critical aspects you need to be aware of. Contact us to chat with one of our foodservice consultants on how to adapt your business to the growth of food delivery services. 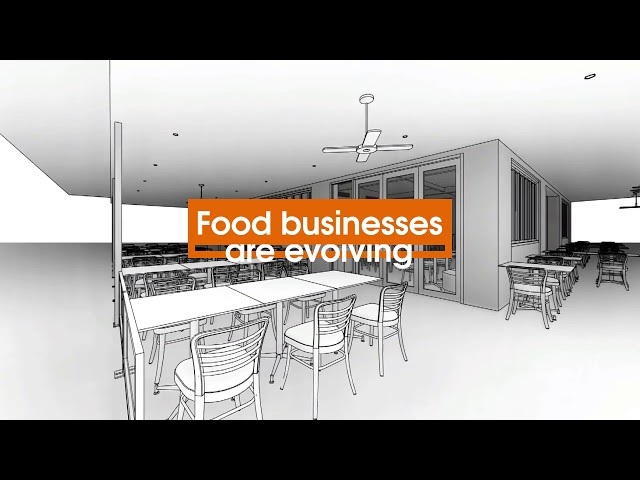 Ready to start planning your restaurant? Make sure to have these 5 things with you at your first food service design meeting.